As the moving parts of your barn, windows and doors may require more maintenance than other features, but their repair will be much less expensive than buying replacements. Fixing windows and doors makes a good "rainy day" project, when you have time to disassemble and adjust the parts that keep these features working. 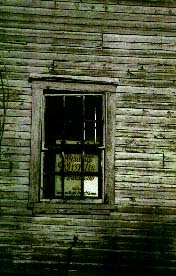 Windows may have broken glass, deteriorated glazing, or problems with the wooden sash and frame. Replacing or patching decayed, broken or missing pieces of the sash and frame may require taking apart the window. Fortunately most windows are made for this. New or recycled glass may be installed with new glazing putty. (Remember to apply boiled linseed oil as a preservative to the wood before glazing.) When painting windows, try to draw a line of trim enamel along the edges of the panes overlapping 1/16 of an inch onto the glass to seal out water. When scraping away excess paint, leave this amount of overlap rather than scraping into the glazing putty. When needed, replacement "barn sash" that matches the original can be ordered from lumberyard catalogs or local woodworkers.